President Obama said that the growing gap between rich and poor Americans is threatening the ideals the country was founded upon. Who has the best plan for shrinking the gap and growing the middle class? 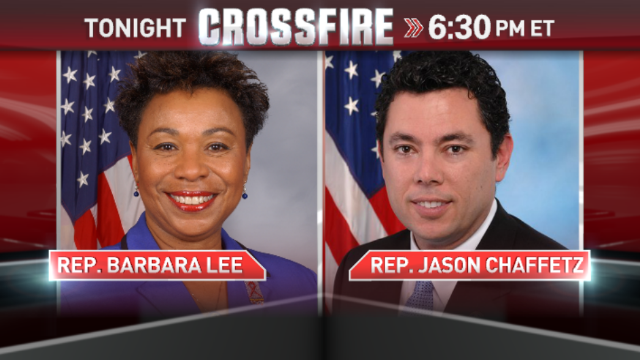 Tonight at 6:30pm ET, Rep. Barbara Lee (D-CA) and Rep. Jason Chaffetz (R-UT) join Newt Gingrich and Stephanie Cutter in the Crossfire to debate the income gap. We want you to weigh in: Do you think the minimum wage should be increased? Vote by tweeting yes or no using #Crossfire or comment on our Facebook post. View results below or through our Poptip results page if you are on a mobile device. The GOP Solution: Turn all the Old, Sick, Poor, Non-white, Non-christian, Female, and Gay people into slaves. Then whip them until they are Young, Healthy, Rich, White, Christian, Male, and Straight. Or until they are dead. Then turn them into Soylent Green to feed the military during the next "unfunded/off-the-books" war. And don't forget the GOP all time favorite............TAX CUTS FOR THE RICH!!!!!!!!! "Sweden, Denmark, Finland and Norway are the gold standards for economic equality and justice. It's not that everyone is equal - it's that the gap between rich and poor is small enough that it doesn't cause all sorts of other problems. Violence, mental illness ... even obesity. All of these are associated with economically split societies, according to decades of research that went into the book "The Spirit Level," by two epidemiologists. Another outcome of income inequality is that it's harder to move up in a society. This has been proved by data, but it's also logical. When the gap is wider, a person has further to go." "If you want to live the American Dream," said Kate Picket, one of the researchers, "you'd better go to Denmark or Finland." Raising the minimum wage will benefit entry level workers but the effects are only temporary. When the minimum wage is raised the pay scales for those already making above minimum quickly go up to maintain differentials between entry level and other jobs and these extra labor costs are soon reflected in the price of for goods and services. At the end of the day the minimum wage worker and others above him have higher pay but things cost more and the government takes more in taxes so at best he stays even, that is if his job is not eliminated entirely. The so-called "income gap" is sort of irrelevant... what's important is reducing bona fide poverty levels. Think about it... if in Greenwich County the poorest person has $40,000 and the richest person had $1.2 billion dollars, well that's quite an income gap, is it not? Income gap and poverty are related but are not one in the same and should not be treated or discussed as such. The GOP is against Government intrusion into our personal lives but they are against women being able to decide for themselves if they have a child or use birth control. When the poor unwed mother is forced to have a child they are against increasing the minimum wage and Aid to Dependent children. But when the child is raised in poverty and turns to crime the GOP would stick a needle in his arm. The old white men of the GOP are against women's rights, minority rights, marriage equality, and anything that does not benefit large corporations. Newt has presented the good idea of after a certain period tying unemployment benefits to participation in a job training program. Barbara Lee's response was a give away to the lefts real intent. She agreed job training is important but should not be required in order to receive unemployment benefits, heavens no, if that were to happen they might not vote for us! I was happy to hear Stephanie Cutter tone down her comments today. After the show yesterday, when she and Debbie Wasserman were yammering like a couple of hens, I vowed I would not watch another show if Stephanie was on.. Today was much better and Stephanie was acting like a co-moderator instead of a hysterical female. She and Debbie Wasserman could do much for more the female movement by acting like adults in lieu of hysterical females. Stop and listen to others. Be courteous with your responses and STOP YELLING. Do the moguls really operate on so tight a profit margin? The fact of the matter is that people need a wage they can live on and if giving that wage required the power elite to sacrifice just a little (maybe 175 percent rather than 200 percent over workers wages) it would be barely felt by the bosses but offer enormous relief to their employees. It's not socialism. It's just a little less greed. Yes, the minumum should be increased. Employers and CEOs make billions of dollars every year while struggling regular employees work really hard can't feed themselves. It is unjust. They are the ones.who contribute to employers and CEOs make billions dollars. They must be part of the equation. I think Rep.Jason needs to understand better they are millions of recent graduates with good skills but can't find good job opportunies. The fact that people make minimum wage does translate we.don't great skills so employers just want to keep us underemployed for their massive profit. increasing means increasing the cost of living. Businesses just increase the prices. Sri lankans live on $250 a month but then everything costs less. So raising the minimum wage has no effect. If raising minimum wage is such a bad idea then why do congress constantly keep giving themselves pay raises? The main issue is our businesses fullfill out of country. When will someone realize we cant outsource to the globe. Things have to be made hear. Will everyone really be in call centers and food service in the usa?